The city of Los Angeles continues to mourn and celebrate the life of Nipsey Hussle. On Sunday (April 14), the Crete Academy unveiled a memorial basketball court in the late rapper's honor during a ribbon-cutting ceremony. The non-profit charter school, which is located in the Crenshaw neighborhood, commissioned a mural in Nipsey's memory, doubling as a reminder for its young students to dream big. "For our kids to look at Nipsy and see to see everything he's done, what he was able to accomplish and how much he gave back to the community is huge for them…because he looks like them," Crete Academy Founder Hattie Mitchell shared with CBS2. "He grew up where they grew up. He's the epitome of everything that they want to be and aspire to be." 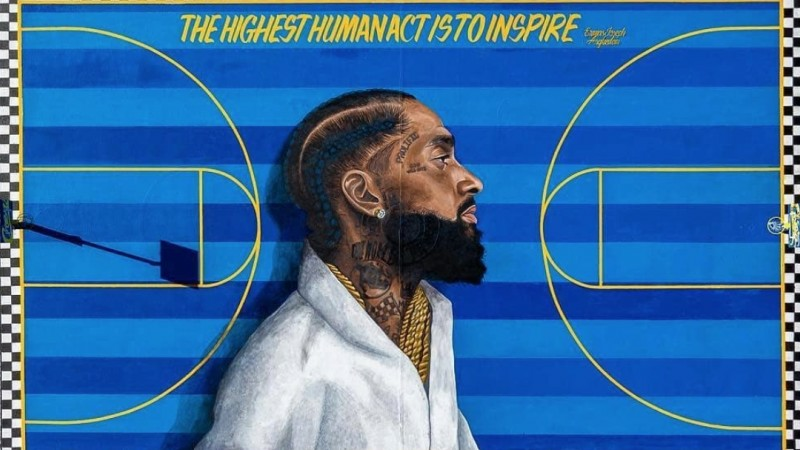 The mural, which features a portrait of Nipsey done by artist Gustavo Zermeno, also includes the text, "The highest human act is to inspire." The project, which came to fruition through the Project Blackboard initiative, was created in partnership with the Venice Basketball League. The mural spans 78 feet of pavement and features the markings of a basketball court. Moments after its unveiling on Sunday, the basketball court was put to its intended use, playing host to a high school showcase and All-Star game. On Thursday (April 11), thousands gathered in Los Angeles at the Staples Center to pay their final respects to Nipsey, who was gunned down just blocks away from the site of the new basketball court. The 33-year-old rapper, entrepreneur and community leader was fatally shot on March 31, sending a shockwave of grief across the globe. At the time of this report, his suspected killer, Eric Holder, is being held on $5 million bail. He is facing one murder count and two counts of attempted murder due to injuring two others during the shooting. Take a look at the new basketball court memorial below. Brooklyn basketball court renamed for Notorious B.I.G.